In November 2013, Glu Mobile announced an interesting partnership with television personality Kim Kardashian West, which would see Glu Toronto developing a game using the star’s voice and likeness. Now, the result of that partnership has been released, as Kim Kardashian: Hollywood is available to download for free on iOS and Android devices. Kim Kardashian: Hollywood greatly resembles the company’s Stardom titles, as players rise through the ranks of fame from E-Lister to major celebrity by completing quests, having photo shoots, finding romance and more to please their fans (and paparazzi). Gamers begin their road to success in a clothing store, when a chance encounter with the star results in a photo shoot. Things spiral quickly from there, as gamers are picked up by an agent and publicist and sent on their way to virtual fame and fortune. An animated Kim Kardashian West makes regular appearances in the game’s storyline, and is featured alongside plenty of recorded voice clips. 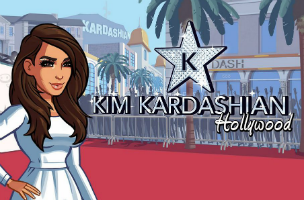 Kim Kardashian: Hollywood is available to download for free on iOS and Google Play. The game is supported via premium currency, which is used to speed up tasks, ‘charm’ in-game characters during encounters, purchase premium clothing items and more.